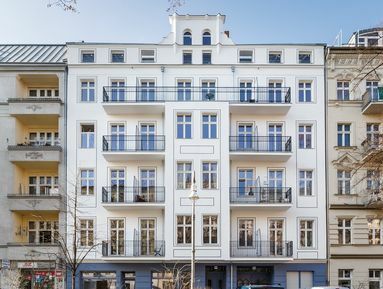 The address Reichenberger Straße 88 is one that is immediately associated with a high quality of living in the heart of Berlin’s home of cool. The building, constructed in 1885 during Berlin’s Grunderzeit (founding period), was completely redeveloped in 1994-95, when the new façade was added, and further enhanced in 2014-15. This wonderful apartment lies on the second floor, at the front of the building. The undoubted centrepiece is the living room with huge bay window, leading onto two separate balconies, from where you can enjoy the finest Kiez-life that Reichenberger Straße has to offer. There is also a generously appointed bedroom and kitchen, both of which are also connected to the balconies. The apartment enjoys many of its original features, such as wooden/parquet flooring, cassette doors and high ceilings. Located in the heart of Kreuzberg, one would be hard pressed to find a more distinctive and popular area of Berlin, famous for its nightlife and range of gastronomic choices. The kaleidoscopic diversity and pace of life in Kreuzberg is what sets it apart from other areas of the city. The building is just a stone’s throw from the picturesque Landwehr Canal and numerous scenic parks, and is well connected to local infrastructure: an underground station is within easy walking distance. All projections are estimated for a period of 10 years.